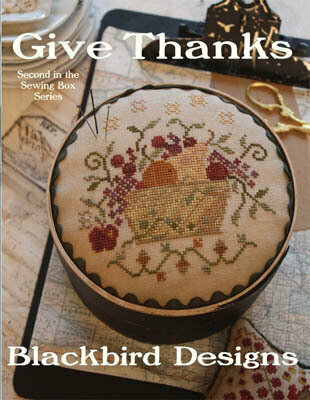 Model stitched on 32 count American Chestnut by R&R Reproductions using Gentle Arts threads (Dark Chocolate - needs 2). Stitch count: 89W x 51H. 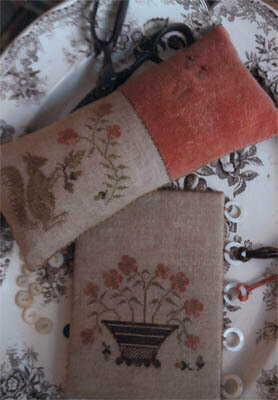 Both models stitched over 2 threads on 32 Ct. Colonial Parchment from Fabrics by Stephanie with Gentle Art Sampler threads. Short Stack Drum - Stitch Count: 32x201. 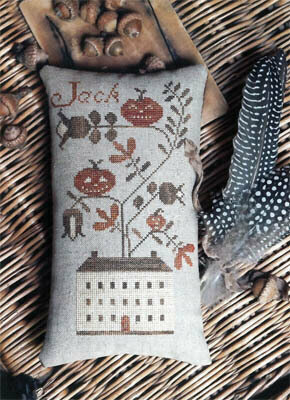 Flap Jack Pillow - Stitch Count: 80x64. 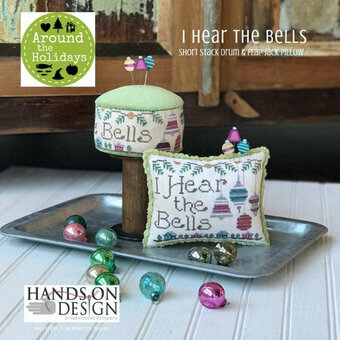 Pattern comes with a piece of shallott velveteen which is enough to finish either the short stack drum OR the flap jack pillow. 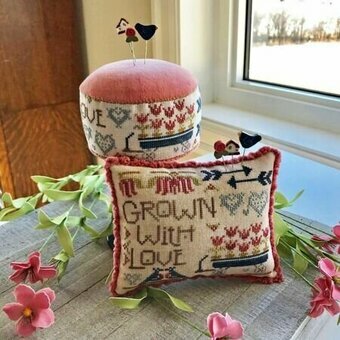 Shown with Pin-Mini Grown with Love pin set from Just Another Button Company. Model stitched over 2 threads on 32 Ct. Antique White Belfast linen with DMC floss, DMC Light Effects and Mill Hill beads. Stitch Count: 66x66 (times 2). Models stitched on 14 Ct. Golden Sunflower Aida by Garibaldi Fabrics (or fabric of your choice) with Sulky 12 Wt. Cotton Petite Solids and Blendables (1045, 1173, 1254, 4010, 4020, 4088). Stitch Count each: 57W x 57H. 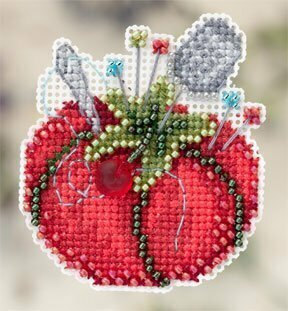 Model stitched over two threads on 28 ct. Lazy River Jobelan using Gentle Art Sampler threads. Stitch Count: 57x57. Model stitched over 2 threads on 36 Ct. Light Mocha Belfast linen with DMC floss, Weeks Dye Works and Gentle Art Sampler threads. Stitch Count: 61x61. Additional itmes required for assembling this design: Lone Elm Lane 4"x4" Clamping Small Box, Wool Natural Roving Stuffing, JP215 Summer Sewing Pins by JABC. Model stitched over two threads on 32 Ct. Platinum linen using Gentle Art Sampler threads. Stitch count 49x50. 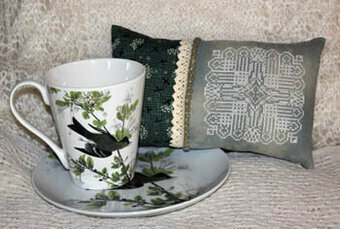 Models stitched over 2 threads on 36 Ct. Natural Edinburgh linen with Gentle Art Sampler threads. "Ann & Her Doll" stitch count: 88x78, "Letters" stitch count: 80x77. Model stitched over 2 threads on 30 Ct. Ligonier Latte by R&R Reproductions with Weeks Dye Works floss (or DMC 3031, 869, 731, 3768, 3858, 3722, 3799, 830). Stitch Count: 75x75. Finishing instructions included. 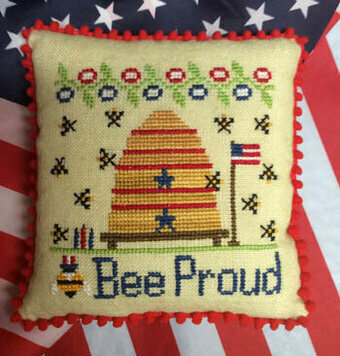 "God Bless America" "USA" "1776". Model stitched on 35 Ct. Lambswool linen with DMC floss and Mill Hill beads. Patterns comes with 3 silver star embellishments. Stitch Count: 55W x 55H. 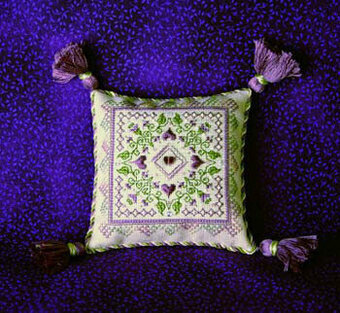 Model stitched on 32 Ct. Pear by Lakeside Linens with Gloriana Silk floss. Finished size is slightly more than 4" in length. Stitch Count: 126W x 72H. 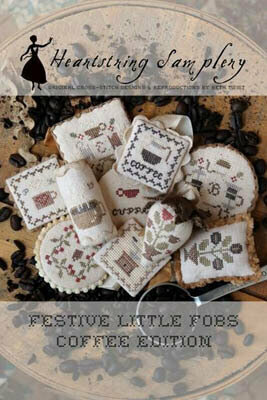 Top design stitched on 32 Ct. La-D-Da Brown by R&R Reproductions. Stitch Count: 56x20. 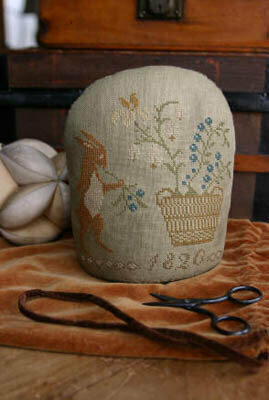 Bottom design stitched on 32 Ct. Clay Pot by Lakeside Linens. Stitch Count: 53x44. 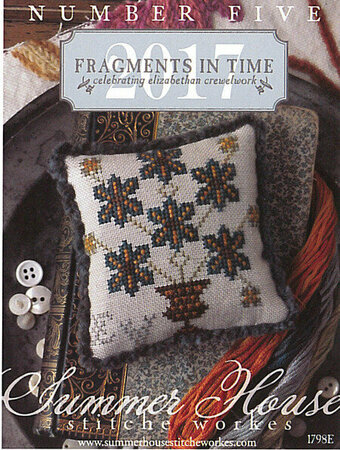 Designs use Classic Colorworks and Weeks Dye Works floss (or DMC 3858, 779, 407). Finishing instructions included. "Spring". Model stitched on 32 Ct. Strawflower linen by Weeks Dye Works with Gentle Art Sampler threads and Weeks Dye Works floss (or DMC 169, 310, 3328, 3013, 317, 3021, white, 950, 834). Finishing instructions included. Stitch Count: 60x50. 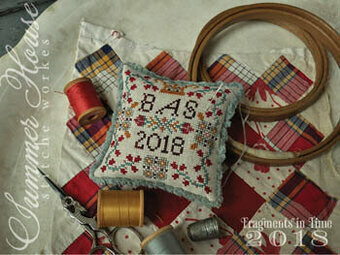 Model stitched on 30 Ct. Raw/Natural Belfast linen with Gentle Art Sampler threads. Stitch Count: 75x127. Model stitched over two on 35 Ct. Cocoa linen with Gentle Art Sampler threads and Weeks Dye Works floss. Stitch Count: 126x72. Model stitched on 36 Ct. Cream Edinburgh linen with DMC floss. Stitch Count: 162W x 162H. Finished size: 4" x 4" x 1 1/2". Finishing instructions included. Models stitched on 36 Ct. Beige linen by Weeks Dye Works. Pinkeep stitch count: 81W x 62H. 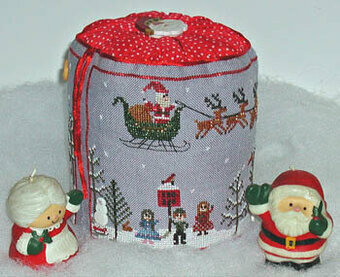 Thread Board Stitch Count: 75W x 66H. 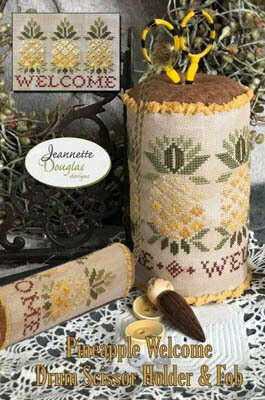 Models both use Gentle Art Sampler threads. Finishing instructions included. 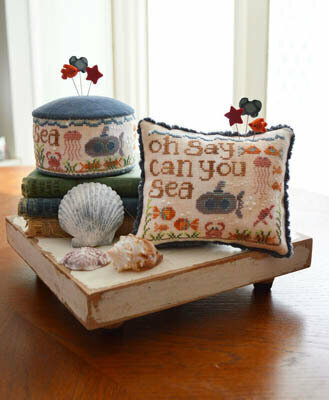 Model stitched on 30 Ct. Tin Roof by Weeks Dye Works, using Gentle Art Sampler threads, Weeks Dye Works and DMC Shown with Pins from Just Another Button Company (JP127). 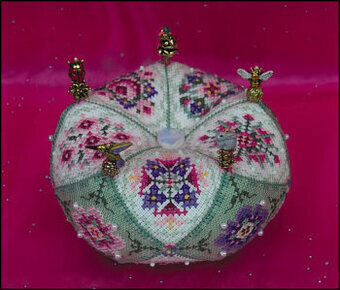 Stitch count for Pincushion is 115x115. Stitch count for basket is 91x91. 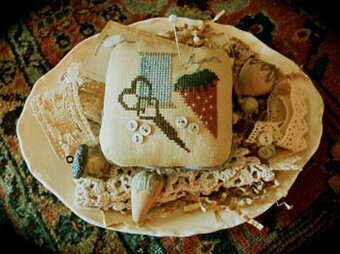 The pin cushion is stitched on 28 Ct. Sandstone linen using two plies over two threads. Important: Cut your fabric at least 8"x8" and center carefully. 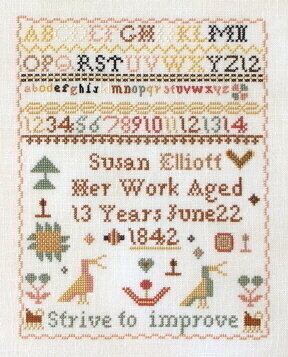 Stitch count 39x40 and using DMC floss. Finishing instructions included. 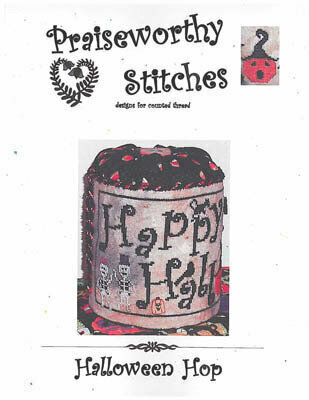 "Happy Halloween" Model stitched on 32 Ct Ancient Linen using Weeks Dye Works, Gentle Art Sampler Threads, DMC Silver Metallic thread, and beads from Mill Hill (or all DMC floss white, 743, 3607, 3837, 741, 310, 890, 300, 310, 921). 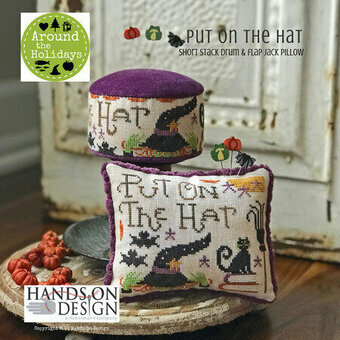 Also required but not listed above Halloween Hop Drum #10426 button pack from Just Another Button Company. Stitch count is 230W x 78H. 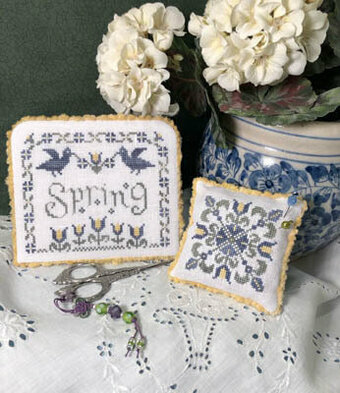 "Spring" Model stitched on 32 Ct. White linen using Classic Colorworks and DMC floss (or all DMC 931, 523, 677). Stitch count is easel - 75w x 61H, pin keep - 41W x 41H. Models stitched over 2 threads on 30 Ct. Cocoa linen by Weeks Dye Works with DMC floss, Weeks Dye Works, Gentle Art Sampler threads and Classic Colorworks. Model stitched over 2 threads on 32 Ct. 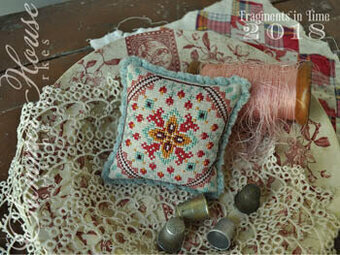 Antique White Belfast linen with DMC floss and Mill Hill Beads. Stitch Count: 66x66 (times 2). Model stitched over 2 threads on 32 Ct. 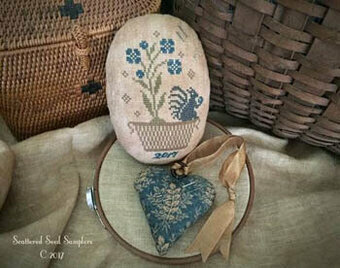 Antique White Belfast linen with DMC floss, DMC Light Effects and Mill Hill beads. Stitch Count: 60x60 (times 2). 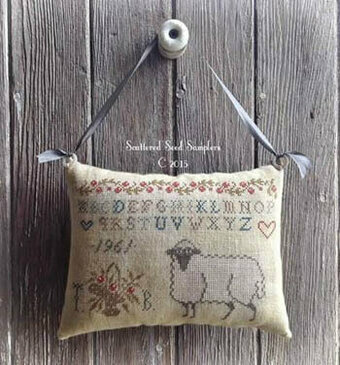 Model stitched over 2 threads on 36 Ct. Vintage Buttermilk with Gentle Art Sampler threads. Stitch Count: 129x56. Models stitched over 2 threads on 36 Ct. Parchment by Weeks Dye Works with Weeks Dye Works floss (or DMC 3866, 3781, 840, 3031, 3011, 3777, 415, 801). Finishing instructions included. 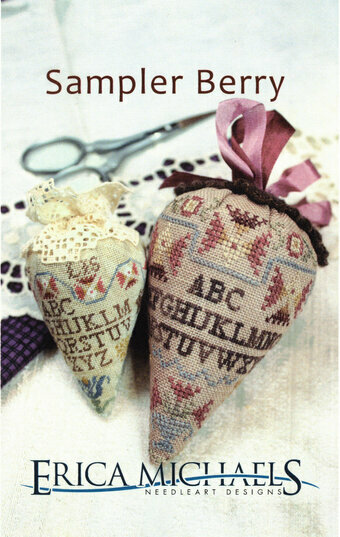 Stitch Count: approximately 30x30 or smaller for each fob. 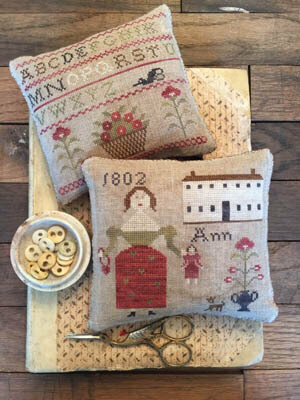 Model stitched on 32 Ct. Colonial Parchment linen from Fabrics by Stephanie with Gentle Art Sampler threads and DMC floss. 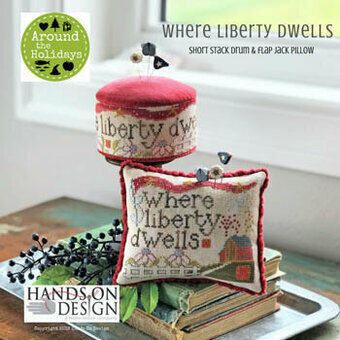 Comes with hand dyed Pea Pod Velveteen by Lady Dot Creates. Shown with Just Another Button Company Pin Mini - Bright & Shiny pin set. Stitch Counts: Drum - 201x32. Pillow - 80x64. Model stitched over 2 threads on 35 Ct. Parchment linen from Weeks Dye Works with Gentle Art Sampler threads, Thread Gatherer Silk N Colors, and DMC floss. 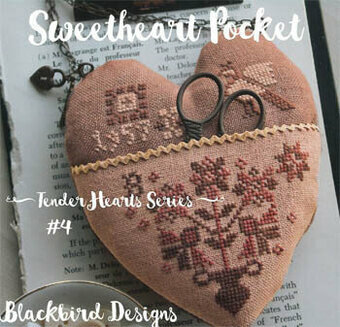 Pattern comes with thread and micro mini buttons. Finished size: 2.1" x 5.8". Model stitched over 2 threads on 36 Ct. Straw linen with DMC floss. Stitch Count: 45W x 70H. 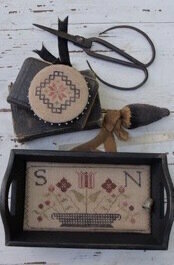 Models stitched on 32 Ct. Colonial Parchment from Fabrics by Stephanie with Gentle Art Sampler threads and DMC floss. Stitch Counts - "Short Stack Drum": 32x201. "Flap Jack pillow": 80x64. 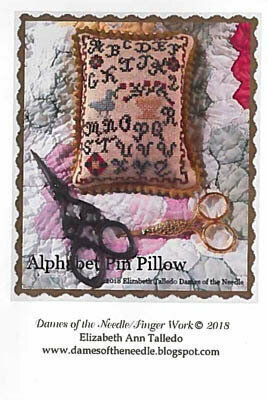 Pattern comes with a 9x10 piece of Purple Onion Velveteen by Lady Dot Creates & is enough to finish either the short stack drum or flap jack pillow. 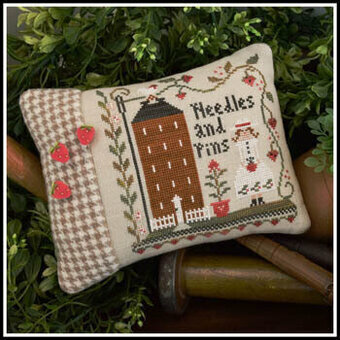 Shown with a Pin-Mini pins from Just Another Button Company. 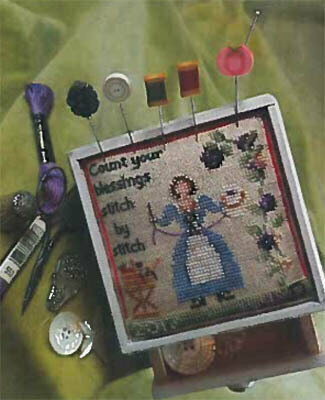 Model stitched on platinum linen (your choice of count) with DMC floss, Threadworx floss, and Mill Hill Beads. 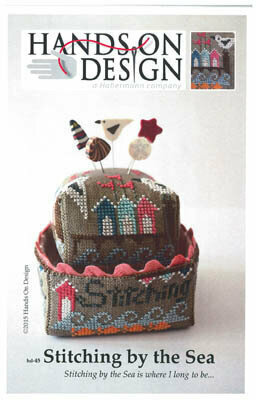 Stitch Count: 55W x 55H. Comes with 3mm crystal clear paillettes and purple cat-eye luminescent heart charm. Model stitched over 2 threads on 32 Ct. Vintage Pearled Barley with Gentle Art Sampler threads (or DMC 169, 3787, 3802, 778, 169 501, 470, 762, 3328). Stitch Count: 129W x99H. Model stitched over 2 threads on 32 Ct. Colonial Parchment from Fabrics by Stephanie with Gentle Art Sampler threads and DMC floss. 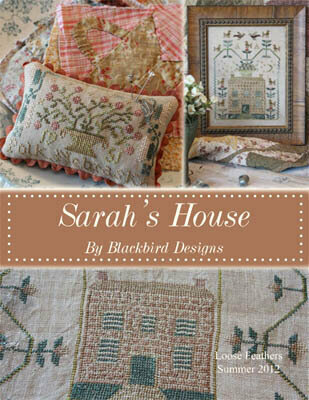 Comes with a 9x10 piece of Blue Corn Velveteen to finish the short stack drum or the flap jack pillow. 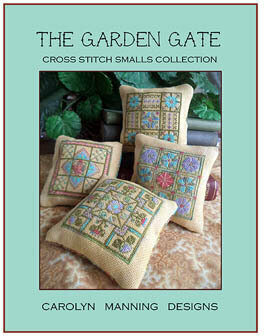 Short Stack - Stitch Count: 32x201, Flap Jack Pillow - 80x64. 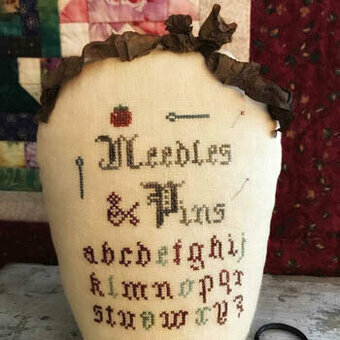 Model stitched over 2 threads on 32 Ct. Ruby Murray linen from the Cauldron/Dames of the Needle with Gentle Art Sampler threads, Weeks Dye Works floss and Classic Colorworks floss. Stitch Count: 60x80. Finishing instructions included. Model stitched over 2 threads on 30 Ct. "Linen" by Weeks Dye Works with Gloriana Silk floss. Stitch Count: 50x50. Finishing instructions included. Model stitched on 32 Ct. Lambswool Jobelan with Classic Colorworks floss. 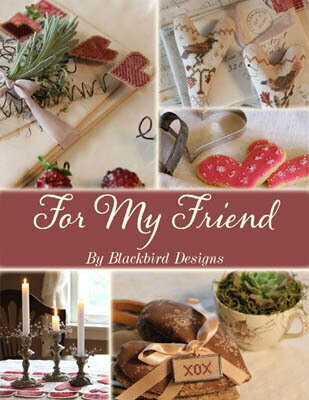 Design comes with pattern, full skeins of floss, and 3 Strawberry pins from Just Another Button Company. Fabric sold separately. Stitch Count: 79x79.